I made my first homemade applesauce for Milo yesterday and boy was it good. 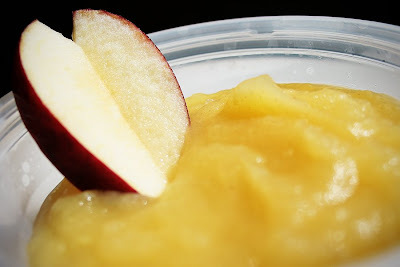 Not only had I never made applesauce but I had never tasted warm homemade applesauce either. It smelled heavenly and tasted even better. I gave Milo his portion and ate the rest. It was so simple too, all I did was peal, core, and chop two Breaburn apples. Then boil the pieces until they were soft, drained off the liquid (which was also very tasty), added a little cinnamon and purred in the blender. Cooking is so new to me that I am constantly surprised at how easy all of this stuff really is. My next project is making sorbet and ice cream (not for Milo, for me!). Sounds wonderful. :D I bet your home smelled great! Sounds so good, I'll have to give it a try. I love your pictures, they are great.